The message from newly minted Wynn Resorts CEO Matt Maddox at the company’s annual shareholders meeting on Wednesday was simple: This company is not its namesake, but the 25,000 employees who work there day in and day out. It’s a point the company is driving home in an attempt to turn over a new leaf after allegations of sexual misconduct by its founder, Steve Wynn, surfaced in January and amid questions about whether Wynn Resorts can continue to be successful after the resignation of its visionary, but disgraced, chairman and CEO. The company, as part of its We Are Wynn advertising campaign, has been putting the faces of its housekeepers, waiters, dealers and other staff out in front of the public in an attempt to emphasize that the company is about more than just one man. Daniel Boone Wayson, the chair of the company’s Board of Directors, a former casino executive and a principal of Maryland-based Wayson’s Properties, a real estate development and holding company, outlined for shareholders some of the changes the company made after the allegations were first published in the Wall Street Journal, including separation from Wynn, settling a $2 billion lawsuit with Universal and selling about 4.9 percent of its stock to Galaxy Entertainment. There was also a shakeup of the company’s board, which lost six members and gained three more — all women, who spoke at the company’s inaugural Women’s Leadership Forum Monday night. Pat Mulroy, who chairs the board’s special committee looking into the allegations against Wynn, told shareholders that the committee has interviewed 114 people and reviewed 3 million documents as part of its investigation. She said the committee — which now consists only of her and board member Jay Johnson, a retired U.S. Navy Admiral, after WestLand Capital Chairman John Hagenbuch announced on Monday he wouldn’t stand for re-election — hopes to complete its work by the third quarter of the year. On the company side, Maddox said that Wynn Resorts has recently established a community and culture department, focused on gender pay and equity issues, leadership development and employee satisfaction. For the first time, Maddox said that the company decided to participate in Fortune Magazine’s 100 Best Companies to Work For survey, which allows employees to confidentially report what’s right and what’s not about their company, and received what he said described as one of the highest scores Fortune has ever seen for a company participating for the first time. But he also noted that there’s still room for improvement. “I am committed to finding out anything that’s not right and we are going to fix it,” Maddox said. He also said that the company brought in the human resources consulting firm Mercer to do a study on pay equity among its employees, looking specifically at gender diversity. In line with that, one of the first things Maddox said that he did on the job was to implement a six-week paid parental leave policy for Wynn employees, mothers and fathers alike. He also said that Wynn has created a leadership development institute to allow line employees to be trained to become supervisors, supervisors trained to become directors, and directors trained to become vice presidents. And, in spite of recent events, Maddox noted that Wynn had the most profitable property in Las Vegas in the first quarter of 2018. He said that compared to this time last year, the company is up significantly in its room bookings. Projects on the horizon in Las Vegas include the already underway construction of a 400,000 square foot convention center on the Wynn’s golf course, slated to be finished in mid-2020; the future development of a 25- to 30-acre lagoon in Las Vegas with beaches, outdoor amphitheaters and watersports; and possibilities for a 38-acre plot of land on which the New Frontier used to sit on and which Wynn purchased in December. 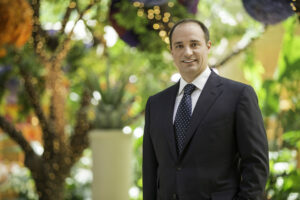 Outside of Las Vegas, Maddox noted the ongoing refurbishment of rooms and casinos in Macau, 11 acres of land at Wynn Palace that the company plans to develop into some type of food and entertainment project and the construction of Encore Boston Harbor in Massachusetts, which is slated to open around June 2019. He also said that he was hosting 22 high-level Japanese executives in Las Vegas Monday afternoon to talk about opportunities for Wynn to expand into Japan. Disclosure: Wynn has donated to The Nevada Independent. You can see a full list of donors here.